Flavorful, tender meatballs simmered in a spiced tomato-kalamata sauce, served over bright couscous dotted with dates. If baking the meatballs, preheat the oven to 350ºF. If frying, ignore this step. In a medium bowl, combine egg and tomato paste and stir until smooth. Add the cilantro, ginger, cumin, and cinnamon and mix until well blended. Stir in the ground beef and ground oats, season with salt and pepper, to taste, and combine gently after each addition. Do not overmix. Rolling with your hands, make about 32 meatballs, about 1-inch in diameter. If frying, In a large saute pan, heat 3 tablespoons vegetable oil over medium heat, and brown the meatballs in batches until golden on all sides. Add more oil, as needed. Now, to make the sauce! In a large saucepan heat the olive oil over medium heat and sauté the onion and garlic until soft but not brown, about 3 minutes. Add the lemon zest and olives and cook for 1 more minute. Add the white wine, deglaze the pan, and let it reduce for a 1 to 2 minutes. Stir in the stock, canned tomatoes, sugar, red pepper flakes, and cinnamon, and simmer to blend flavors, about 7 minutes. Season with salt and pepper, to taste. If you baked your meatballs, once they've finished cooking, transfer them gently to the saucepan with the sauce and let simmer for 10 minutes. If you fried your meatballs, transfer them to the saucepan with the sauce and simmer for 20 minutes or until cooked through completely. Meanwhile, make your couscous! 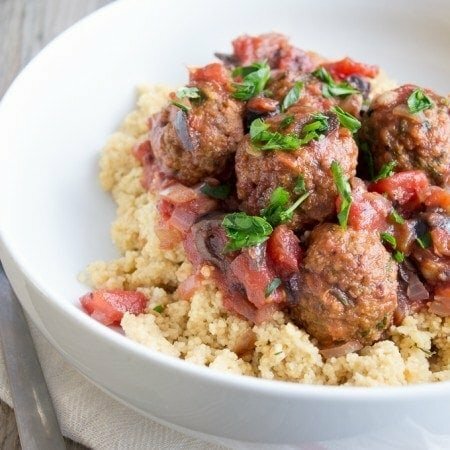 Divide up your couscous into individual bowls, spoon meatballs and sauce over couscous, and garnish with fresh parsley. Nom nom!